The French website Femmes-references.com advises our ageLOC Transforming Night for its amazing anti-ageing results. A nice article introduced our Nu Skin Winter Village promotion for the top-class readers of the website. The beauty section recommends as their favourite our ageLOC Tru Face Essence Ultra for removing small lines and wrinkles. The 24th week edition features a short article on our newly launched Epoch Essential Oils product range. Beauty journalist Susanne Weiss has tested ageLOC Me and is so excited about the space-saving innovation, which is also practical for travels. In the latest January edition of Madame you will find a full-page advertorial of ageLOC Me. The online site dedicated to premium category products published an article on our newly launched Epoch Essential Oils products. The popular website Notre-Siècle.com adored our ageLOC Future Serum for its effective firmness and anti-ageing properties. Our ageLOC Galvanic Spa System is featured in the skin firmness special of the famous magazine Créola. The online version of the magazine committed to giving advice for healthy body and mind published an article on the new Epoch Essential Oils products. The article highlights the benefits of essential oils and the wide range of scents as well. IgG Boost® is recommended to support the immune system for the upcoming winter-time by the popular health and lifestyle magazine. The 21st issue of the popular magazine features an eye-catching page about our ageLOC® Edition Nu Skin Galvanic Spa System® II. Our NaPCA Moisture Mist is featured in the Beauty Special of the famous French magazine Femina. ageLOC® Tru Face Essence Ultra is featured on an attractive full page advertisement in the 5th issue of the luxury magazine which is targeting the top audience on the market who enjoy life and love beautiful things. The ageLOC Galvanic Spa System II is mentioned at Women's Health as "Spa treatment with anti-ageing-effect for at home". The popular sports magazine Runner's World recommends our Epoch Firewalker for revitalizing tired legs and feet. The Danish sports magazine SPORTSFANPLUS wrote this article about how to improve your hair in only one week with Nu Skin hair care. Tempus Magazine features our ‪Galvanic Body Spa on page 61. You can read the full magazine here. The popular French blog MissWellWell adores the ageLOC® Tru Face Essence Ultra for its rapid results and a more elastic, rejuvenated skin. For a soft and hydrated skin the famous French blog L’Instant Mode recommends our NaPCA Moisture Mist. The famous French regional newspaper Nice-Matin suggests our NaPCA Moisture Mist for the summer. It is an ideal spray to refresh and hydrate dry skin and hair. In the July issue of the famous online magazine descopera.ro, in the News section, our ageLOC® Edition Nu Skin Galvanic Spa System® II is presented in a nice and detailed article entitled “Start the Force of Youth”. In the Special Edition of the high-class Luxury Magazine our innovative ageLOC® Tru Face Essence Ultra is presented in a nice, 2-page long article entitled “Defy Gravity”. The blogger behind this blog has reveiwed several of our Nu Skin products and likes the results. Do you love our EPOCH Glacial Marine Mud? You might not be the only one, check the ‪beauty blogger review from Pink Julep here. The husband of this beauty blogger got so lucky to try ageLOC Tru Face Essence Ultra and his fine lines looked less prominent. Protect yourself against sunburn in the cities with Nu Colour Advanced Liquid Finish and our great sunscreen products: Sunright Lip Balm SPF 15 and Sunright SPF35. The fantastic ‪‎beauty blogger Pink Julep has done it again! See her review of our ageLOC Tru Face Essence Ultra. The famous French online magazine The Fashion Week Coffee tested our ageLOC Galvanic Spa System II and is amazed by the positive and rejuvenating results on the skin! A nice article is published on the online site of the well-known women’s magazine about our latest innovation: ageLOC Tru Face Essence Ultra. A special article is devoted to our ageLOC Edition Nu Skin Galvanic Spa System II, the secret to a youthful look in one of the best-selling women’s magazine. The German woman's and lifestyle magazine JOY listed the ageLOC Galvanic Body Trio in "special beauty devices for a firm body". The German woman's online magazine www.brikada.de is introducing ageLOC Tru Face Essence Ultra in the following article. The famous French magazine Oops! loves the fresh sensation of our hydrating spray NaPCA Moisture Mist. The famous French online magazine Luxsure finds the Epoch IceDancer, Epoch Sole Solution and Epoch Firewalker ideal solutions for heavy or tired legs and feet this summer! Our expert in firmness, ageLOC True Face Essence Ultra, is featured in the May issue of the popular glossy magazine. Germany's Next Top Model candidate Ira Meindl is recommending Creamy Hydrating Masque in the German magazine "Closer". She says that this product is her "Holy Grail". The famous French magazine Stylist declares our hydrating spray NaPCA Moisture Mist is a must-have for this summer. The French website Puissance Zen presents our hydrating spray NaPCA Moisture Mist and our rejuvenating serum ageLOC® Tru Face Essence Ultra as our latest innovative products. The French pharmaceutical online magazine Pharma Beauté presents our Epoch IceDancer in their selection of the week. The French online luxury magazine Paris Leluxe recommends our hydrating spray NaPCA Moisture Mist to refresh on hot summer days. The popular French blog Minipster loves the immediate effects of our ageLOC® Edition Nu Skin Galvanic Spa System® II in combination with our Nu Skin Galvanic Spa System® Facial Gels. The blog also praises our ageLOC® Tru Face Essence Ultra and ageLOC® Transforming Night for a soft, hydrated skin. The beauty blogger behind Pink Julep, listed our amazing ageLOC® Radiant day in her post “what is in my bag”. As an official sponsor Nu Skin was featured on all official materials of the event. In the program guide you could find a detailed description of LifePak®+ and R2 contributing to the success of the Hungarian athletes. The famous international magazine recommends in the beauty section our ageLOC® Body Shaping Gel. Also a beautiful ad is placed next to it announcing the launch of ageLOC®Tru Face Essence Ultra. The online portal for consumers “cityblick24” presented Nu Skin’s ageLOC Tru Face Essence Ultra and is truly amazed from its rejuvenating effect. The online magazine promoted our new Nu Colour® Advanced Tinted Moisturiser & Nu Colour® Advanced Liquid Finish in a short article as great products for the spring and summer time! Dita Time rates ageLOC Tru Face Essence Ultra to one of hers favorites in March and she certainly feel a huge improvement in her skins hydration, firmness and brightness. "My skin feels amazing after using the Nu Skin Galvanic Spa” Make up artists and beauty bloggers From Matte to Metallic made a video on how they feel while using ‪Nu Skin ‪Galvanic Spa. The beauty blogger behind Naija Living tried our ageLOC Tru Face Essence Ultra and her skin feels plumper, firmer and the texture has become much smoother since using this product. This beauty blogger tried our hair care line and was very happy with the results. Beauty blogger Pink Julep has posted a fantastic review of our beloved ‪‎EPOCH Firewalker. It is an honor to be ‪featured in the prestigious Tempus Magazine (page 61). An interesting article was shared with the readers on the process and trends of ageing followed by the benefits of ageLOC® Tru Face Essence Ultra. The famous Slovak online site featured an article about tips for the perfect make-up and here we find a recommendation for our new Nu Colour® Advanced Tinted Moisturizer SPF 15 with anti-ageing benefits. In the novelties section the lifestyle magazine recommends our newly launched 120 capsules packaging of Tegreen highlighting the benefits of green tea consumption. The French blog Miss Well Well adores the soft sensation of our refreshing spray NaPCA Moisture Mist. The French online magazine CHLMag loves the immediate benefits of our rejuvenating serum ageLOC Tru Face Essence Ultra! The famous French blog Creative Beauty Paris promotes our hydrating spray NaPCA Moisture Mist as the ideal solution for refreshing your face, body and hair! The French beauty blog 24h-Beauté recommends our hydrating spray NaPCA Moisture Mist for the upcoming summer days. The article is about devices with electronic stimulations for a firm body. The French swimming champion Muriel Hermin talks about our amazing Pharmanex products in an interview with Ici Paris. The French magazine Cosmétique Mag presented our ageLOC Tru Face Essence Ultra in their list of rejuvenating products. The famous French website Hello Coton picked up on the great review of our ageLOC Tru Face Essence Ultra on the famous newsmagazine France Net Infos. The French Blog Beauté is very statisfied with the results of ageLOC Tru Face Essence Ultra! The French website Beautytricks was giving away 4 Tru Face Line Correctors in this contest for the International Women's Day. The French website Fashions Addict assures the positive and lasting effects of our ageLOC Galvanic Body Trio. The article is about how to contour your belly shape. The amazing outcomes of our anti-ageing product ageLOC Tru Face Essence Ultra are presented in the online magazine United Fashion For Peace. The blogpost on Les Tribulations d’Anais about our Exfoliant Scrub and Creamy hydrating Masque got picked up by the famous French website Hello Coton! The French professional magazine “Les Nouvelles Publications” recommended our ageLOC Elements as the perfect anti-ageing shield! A great article on our BioPhotonic Scanner S3 on the famous Romanian site focused on science and innovation. Do you love our ‪Epoch Baobab Body Butter? ‪Beauty blogger Pink Julep is a big fan. Erisa Magazine writes about our Liquid Body bar and Dividens shaving cream. Pink Julep is soothing sore muscles with Epoch IceDancer. The article appeared in the local magazine of Munich called "Hallo München" on February 18 and is about the media consultant Natalie Becker who is positively reporting on the ageLOC Galvanic Spa System II. The Year book features the biggest MLM companies in Hungary including an amazing review on the fact and information good to know about Nu Skin. The French website Prestigieux Univers promoted our new anti-ageing product Tru Face Essence Ultra in their list of beauty-recommendations! The French famous website Hello Coton picked up on the blogpost about our amazing product ageLOC gentle cleanse and tone! The ageLOC Galvanic Spa System is featured in an article of the French beauty and luxury magazine "Formes de Luxe". The well-known fashion and trend magazine posted a short description about our R2 product on their official Facebook page. The popular lifestyle magazine published a detailed article about our Nu Skin Winter Village promotion online. The winter edition of the prestigious magazine features ageLOC Edition Nu Skin Galvanic Spa System II in a luxury selection of Christmas gift ideas. The best-selling fashion and trend magazine featured ageLOC Edition Nu Skin Galvanic Spa System II and ageLOC Future Serum in the article „Beauty is a long term investment” while TR90 M-Bar is placed in another article entitled „Sporty but charming”. In the novelties section of the lifestyle magazine our Epoch Essential Oils are featured with a short description. The famous webzine Beauté Futée Le Mag.com really liked our Tru Face Line Corrector for its amazing anti-ageing properties. The popular e-magazine Actu-Beauté.com recommends our wonderful Epoch Baobab Body Butter for dry skin. The beauty section of the well-known beauty magazine reminds on the fact that the sudden weather change and extreme weather can cause lifeless looking skin, but using a serum twice a day can help to turn back to its firm and silky look. With this advice our ageLOC® Tru Face Essence Ultra is recommended. ageLOC® Tru Face Essence Ultra is recommended in the News section of the 22nd issue of the magazine aiming to provide highly attractive themes to its readers. The French beauty blog Geribook adores the moisturizing effect and great texture of our Epoch Baobab Body Butter. Our ageLOC® Tru Face Essence Ultra is represented in the beauty magazine focusing on fashion and cosmetics with a full page. The 19th issue contains a beautiful page with the most important facts good to know about our Pharmanex® BioPhotonic Scanner S3. The famous French magazine Glamour! adores our hydrating spray NaPCA Moisture Mist. UK´s most sophisticated beauty and lifestyle guide; The Ultimate Beauty Guide 2015-2016 was launched in July and features a double spread article about our beloved ageLOC Tru Face Ultra. The ‪beauty blogger Beauty Division has kindly written a lovely blog on ageLOC Tru Face Essence Ultra! The well-known French magazine Gazelle includes our NaPCA Moisture Mist in their beauty-list of most hydrating products. The French website Dynamic Seniors recommends our NaPCA Moisture Mist to keep a good hydrated skin this summer. According to the French magazine Psychologies our NaPCA Moisture Mist is a perfect solution for refreshment and hydration of the skin. A nice banner of our ageLOC Edition Nu Skin Galvanic Spa System II is placed on the online site of the famous magazine BBC Science World. After clicking on it,you can read a detailed article focusing on the products and the science behind them. Polishing Peel is recommended in the article „Baby skin – the receipt of glow” for the summer time. The same issue contains a nice article on the benefits of ageLOC® Tru Face Essence Ultra. This beauty blogger made a great review on our ReNu Hair Mask. The article on the popular online magazine features tips and tricks for women how to look perfect after only 5 hours slept. As a product to recommend they chose our innovative ageLOC® Tru Face Essence Ultra! The German woman's online magazine www.brikada.de is introducing Nu Skins's footcare-trio of the Epoch series: Firewalker, Icedancer and Sole Solution - three products that pamper your feet from toe to heel. Our Epoch IceDaner and Epoch Firewalker are presented on the French website Herault Tribune as the perfect solution for heavy legs and dry feet this summer. A professional beauty consultant recommends our anti-ageing products to be even more beautiful inside and out in the famous French magazine Metz Femmes. The beauty blogger behind stransonbeauty, published a nice article about our latest innovation: ageLOC Tru Face Essence Ultra. The world’s leading style magazine gave the title „The secret of youth” to the product description article of ageLOC® Tru Face Essence Ultra. Our new ageLOC® Tru Face Essence Ultra is promoted with a detailed description about it’s benefits and key ingredients. The online site of the popular glossy magazine Cosmpolitan recommends you a solution for getting a slimmer, firmer and smoother body for the summer by using our products ageLOC Galvanic Body Trio. The German magazine Closer includes our ageLOC Galvanic Body Spa in their list of Hightech Beauty Tools that make your skin appear firmer and younger without surgery. The French website Jemepropose recommends the NaPCA Moisture Mist for a refreshed, hydrated and toned skin during summer. The French website Capgiris loves the fresh sensation of our hydrating spray NaPCA Moisutre Mist and is also amazed by the immediate effects of the ageLOC® Tru Face Essence Ultra. The French online magazine Obiwi presents our ageLOC® Tru Face Essence Ultra as a perfect gift for Mother’s day for a softer, firmer skin. The leading premium category lifestyle magazine, famous for its superior content and design, advertises our ageLOC Tru Face Essence Ultra. The website publishing news about MLM companies in Romania featured a long article on our Opportunity event hold in Bucharest. The French entrepreneurial blog TousOsommet talks about the history and the interesting elements that make Nu Skin a worthwhile business! The famous French website Paris Frivole describes our ageLOC® Edition Nu Skin Galvanic Spa System® II as the Rolls Royce of high-tech anti-ageing products! It also qualifies our rejuvenating serum ageLOC® Tru Face Essence Ultra and nourishing Epoch® products as essentials. The beauty news section of the popular magazine introduces our new Advanced Liquid Finish SPF 15 and Advanced Tinted Moisturiser SPF15 products. The issue also contains our beautiful ageLOC®Tru Face Essence Ultra advertisement. A nice article about our new ageLOC® Tru Face Essence Ultra is published on the online magazine of the worldwide known glossy magazine. The French online magazine Toute La Culture listed our hydrating spray NaPCA Moisture Mist in their product selection for a magnificent skin! The Nu Skin Galvanic Body Spa is mentioned in the April edition of the German woman's magazine "Bild der Frau". The French magazine Next includes our impressive anti-ageing product ageLOC Tru Face Essence Ultra in their beauty-list for a soft skin! The famous French website Hello Coton picked up on the great review on 24h-Beauté about the NaPCA Moisture Mist. The French online luxury magazine Luxe-magazine found our ageLOC Tru Face Essence Ultra miraculous and recommends the various benefits! The French magazine Aquae presents the excellent benefits of our anti-ageing serum ageLOC Tru Face Essence Ultra. The famous French magazine Réponses de Questions de Femmes tested and loved our amazing anti-ageing serum ageLOC Tru Face Essence Ultra! The online magazine featured a long article on our new ageLOC® Tru Face Essence Ultra with the title „Magic capsules”. The online magazine diva.sk gives tricks and tips for the perfect make-up. Our new Nu Colour® Advanced Liquid Finish SPF15 product is mentioned herein as "fancy dot at the end." The German beauty magazine "Flair" is introducing the ageLOC Edition Nu Skin Galvanic Spa System II in the April edition. Nu Skin Tru Face Essence Ultra is mentioned in the German Women's magazine "Welt der Frau" in the April Edition. Beth Hinds a beauty blogger from All Things Beautiful made these classic Nu Skin products: Creamy Cleansing Lotion, Exfoliant Scrub and Moisture Restore Day SPF 15 Normal to Dry Skin part of her favourite products in April. Our Senior Sales Manager West Europe & Israel Marie Jozefiak is presented in the management-list of the famous French magazine Cosmétique Mag. Our ageLOC®Tru Face Essence Ultra is featured on the top among the novelties in April highlighting its benefits. The same article contains a great review on our TR90 Programme and also highlights the benefits of IgG Boost. The French blog Girl Tendance tested our ageLOC Tru Face Essence Ultra for a month and is delighted about the outcome! The famous French online news magazine France Net Infos tested and obtained amazing results with our new ageLOC Tru Face Essence Ultra. Pink Julep is saving her soles with Epoch Sole Solution. The famous French online Magazine Top Santé organizes a contest to win the amazing products ageLOC Galvanic Body Spa and ageLOC Galvanic Spa System II. Our favourite cleansing product ageLOC Gentle Cleanse & Tone is part of the daily skincare routine on the French blog Mind, Body & Mood. March 2015 - Black or White (France) The ageLOC Cleanse and Tone was presented in the beauty-list of the French magazine Black or White! The French blog Les Tribulations d’Anaïs promotes our marvelous products Exfoliant Scrub and Creamy Hydrating Masque! The French blog Vive les Pestes tested our amazing anti-ageing serum ageLOC Tru Face Essence Ultra and experienced great results! The professional French magazine ‘Cabines’ listed our wonderful serum ageLOC Tru Face Essence Ultra in the novelties’ special for facial care. Matte To Metallic writes about our ageLOC Tru Face Essence Ultra. The professional French website Conseil-Psy recommends our fantastic anti-ageing product ageLOC Tru Face Essence Ultra for a more youthful and elastic skin! Pink Julep is loving our Epoch Baobab Butter. UK’s largest Asian weekly newspaper listed the ageLOC Transformation Set on a top 10 for "Hottest luxury beauty picks". A great review of our beloved product ageLOC Gentle and Cleanse on the French blog Look at my clothes! All the great benefits of the new anti-ageing serum Tru Face® Essence Ultra are presented in an article on Scoop-People.com. Editor Honey Tremchen absolutely loves this must-have! Glam Touch promotes a smooth skin with the anti-ageing serum Tru Face® Essence Ultra and explains how to use our product! Online magazine People Inside promotes our wonderful serum Tru Face® Essence Ultra for a more youthful and radiant skin! The online magazine Paris Frivole tested and approved our anti-ageing product True Face Line Corrector! The rich and foaming cleanser ageLOC® Gentle Cleanse & Tone is promoted on the French website of Herault Tribune as the perfect catch for a fresh and young skin! Nu Skin appears in the nation-wide women's magazine called "Bild der Frau". This article was published on February 27 and introduces the ageLOC Galvanic Body Spa. Erisa Magazine is targeting skincare issues with some of our beloved Epoch products. 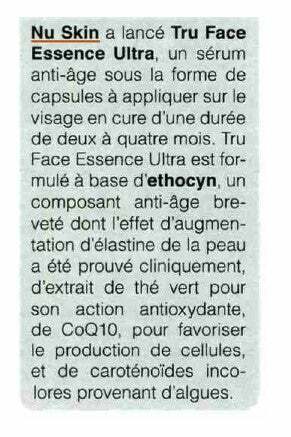 The French daily ‘Le Télégramme’ presents the extraordinary outcomes of the Tru Face Essence Ultra serum in their beauty selection.